As the summer nears its end, I have a beautiful herb garden that needs to be attended to desperately. A couple weeks ago, I spent some time canning homemade chocolate mint sauce which was absolutely divine and gut friendly. I will blog on that later, but in the meantime, I have this huge bush of pineapple sage that is so beautiful. I didn’t want to just dry the leaves and make a tea out of it as I normally do with my fragrant herbs. Instead, I wanted to try it in something that I would eat. Now for those of you that know your herbs, pineapple sage is best in salads and savory dishes, especially meat dishes. Well, a meat dish wasn’t going to work for me so I decided to try making a pineapple salsa. Before I get too far ahead of myself, I want to share with you all why pineapple sage is in my garden. Besides the fact that it is a beautiful plant that has attracted the butterflies, when rubbing the leaves between your fingers, it smells like pineapple. This herb was new to me and I love things that challenge me in the kitchen. Pineapple sage has some great benefits that have been said to help those with depression, anxiety, constipation, hypertension, digestion aid, and heart burn. I love these types of benefits. Now, I will caution those that consume this herb, do so in moderation. I would not suggest eating just a salad of pineapple sage. In my opinion, food is medicine, our family eats certain foods when we aren’t feeling well or if we feel we need to be balanced in a certain area, example: I eat a fresh raw kale and spinach salad when I am not feeling well or feel a cold coming on. When I do this, I boost my vitamins and give my body nutrients that it would need to fight off the bad guys. Anyways, pineapple sage is an herb that I felt that would benefit me in more than one way. So lets get on to the recipe. The recipe I found was from Handmade Frenzy. It was the closest recipe that I found that would work for what I needed. I have changed this recipe quite a bit. She calls for onions, garlic, brown sugar, and clear jel (I am not even sure what that is.) Since I struggle with digestive issues, I have to stay away from onions, garlic, and some forms of sugar. And I am pretty sure that whatever “clear jel” is, my gut would not be happy with that either. So, what I chose to do was omit the garlic and onion, use coconut sugar instead of brown sugar and add some lemon juice for the preservative. I also made some adjustments to the measurements to this recipe. I made this a large batch to can about 12 pint sized jars. I also used all organic veggies, fruit, and spices, however if that does not fit in your budget, choose what works best for you. 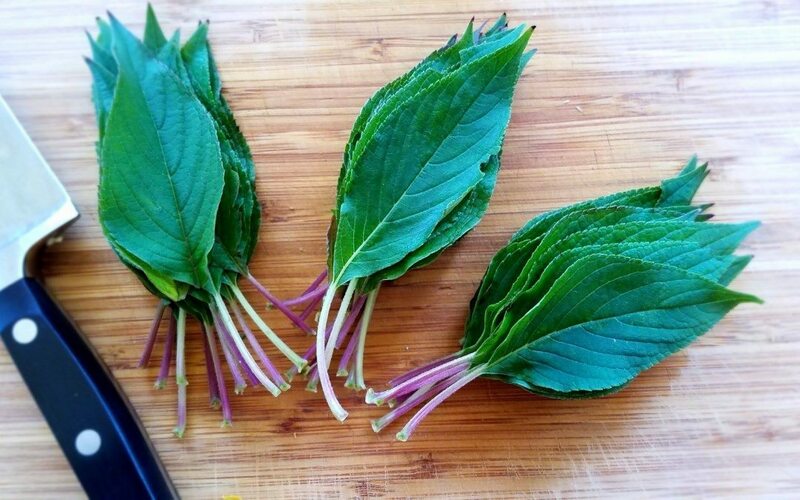 Those of you that know your herbs, pineapple sage is best in salads and savory dishes, especially meat dishes. Well, a meat dish wasn't going to work for me so I decided to try making a pineapple salsa. This salsa is sweet with a little bite, not much heat at all. It has a nice full and flavorful taste and its hard to stop eating. This recipe is made for large canning batches. Please see notes for any adjustments. 15 cups tomatoes of choice, diced I used vine and roma tomatoes. 6 cups pineapple, crushed (3 lrg. cans, drained) I used canned pineapple, in water, NOT JUICE or Concentrate. 6 jalapeno peppers, seeded I cut two full peppers with seeds to keep a little heat and the rest seeded. 3 tri-colored peppers, diced Red, Yellow, and Orange peppers. 1/2 Tbs. salt I lean on the lighter side of salt, so taste and add to your liking. 20 leaves Pineapple Sage Cut off stems (discard stems) , cut leaves and bruise with mortar and pestle. Remove stems and discard. Cut pineapple sage leaves into small pieces and place into the mortar. Bruise leaves with the pestle. Mix all ingredients, including bruised sage, together well in a large container. Fill jars leaving a little head space at the top. Process in a hot water bath canner for 15 minutes. 1 cup crushed pineapple (1- 16 oz can), You can also used a fresh pineapple and dice it. I thought this was a recipe using pineapple sage but it was not in the ingredients list. Is that a mistake? Sorry for the delay in response. I have updated the recipe. Thank you for bringing that to attention, I appreciate it. 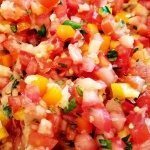 How much pineapple sage is used in the salsa? About 20-30 medium to large leaves. I also heard the flowers were edible as well! So Sorry, I don’t know how I forgot to add the main ingredient. I have updated that. Thank you for your comment. I don’t see the pineapple sage itself listed in ingredients — how much to use? So Sorry, I have updated that recipe. Thank you.